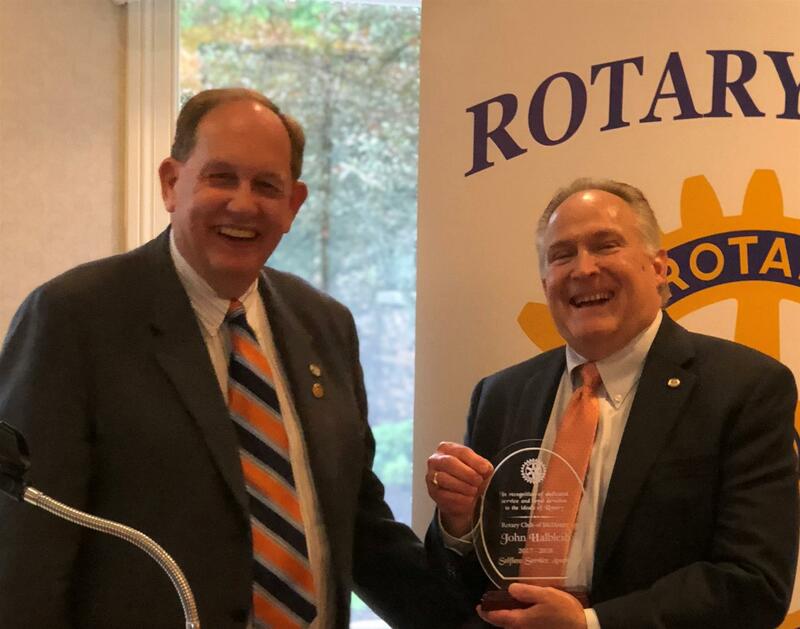 As a result of the excellent leadership of Bill McLemore (Club President 2016-2017), Denis Buch (Club President 2017-2018) and their respective leadership teams, the Rotary Club of McHenry received from Rotary District 6440: in 2017, the “2017 Club Service Award” (and other awards); and in 2018, the “2018 Club Service Award” as well as the “2018 Club Website Award”. The excellent Leadership of our Club has spanned decades. 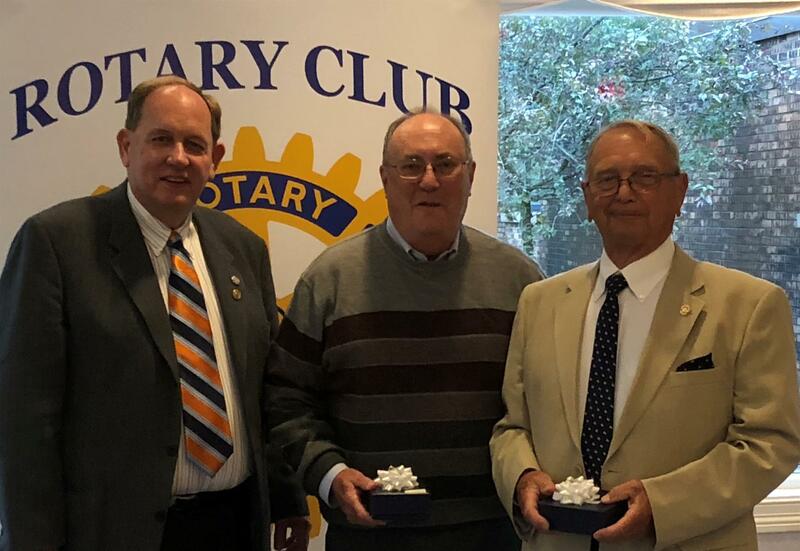 Over the last month, the Rotary Club of McHenry recognized three Members for their multidecade dedication and service to the Rotary Club of McHenry and the communities we serve. These include: Bob Blake (more than 63 years); Don Arvidson (more than 54 years) and Mike Low (more than 41 years). Bob, Don and Mike – thank you for all that you have done for our Club and community, as well as the fellowship we share. 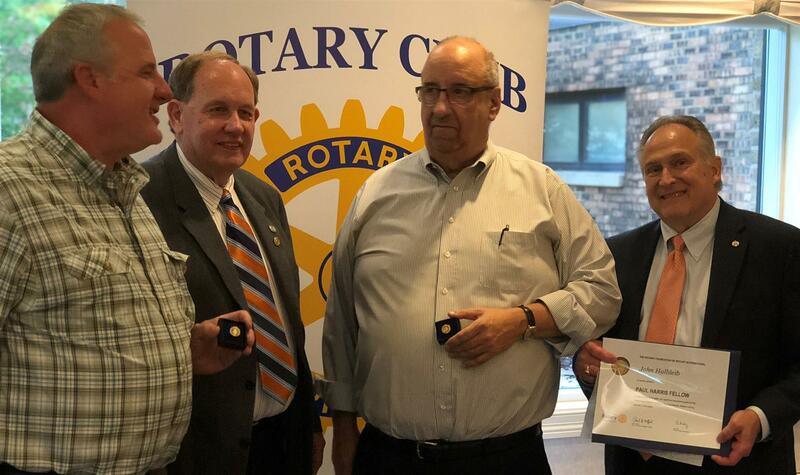 Pictured below from left to right are: Denis Buch (Club President 2017-2018), Mike Low and Don Arvidson. New Paul Harris Fellows included John Halbleib (Club President (2018-2019)), Ron Newman (Community Service Chair), and Don Tonyan, Sr. (Co-Chair of the Blues, Brews and BBQs Committee). Pictured from left to right are: Don Tonyan, Sr. (Co-Chair of the Blues, Brews and BBQs Committee), Denis Buch (Club President 2017-2018), Ron Newman (Community Service Chair), and John Halbleib (new Club President (2018-2019)). Bill McLemore inducted new officers, who are pictured below. Not pictured are Cheryden Juergensen (Treasurer), Tony Huemann (Sergeant-at-Arms), and Diana Mark (Club Service Chair). Pictured below from left to right are Bill McLemore (Past President 2016-2017, and past District Governor of Rotary District 6880 (1998-1999)), John Halbleib (President 2018-2019), Dawn Cassiday-Turner (President-Elect), Ron Newman (Community Service Chair), Karen Lavin (International Service Chair), Craig Adams (President Nominee) and Tom Webb (Youth Service Chair). Thank you, Denis, for your excellent leadership, which leadership continues the family tradition begun by your parents, Jerome and Ethel Buch. Newly inducted Club President John Halbleib expressed thanks and appreciation to the Club Members and their spouses (or significant others) who have effectively integrated him into the Rotary Club of McHenry, as well as welcomed John and Jeanne into the community. John expressed the honor and sincere appreciation with which he accepts the Club’s Presidency. As a final note, John introduced and thanked his family for sharing this moment. John’s family is pictured below. From left to right: Jacob Duffy Halbleib (Son), Quinn Black (Granddaughter), Jeanne “Gorgeous” Duffy (Wife), Molly Black (Granddaughter), John Halbleib, Josh Dolitsky (Son), Colleen Brogan Black (Daughter), Ali Brogan Healy (Daughter) and Caroline Healy (Granddaughter).